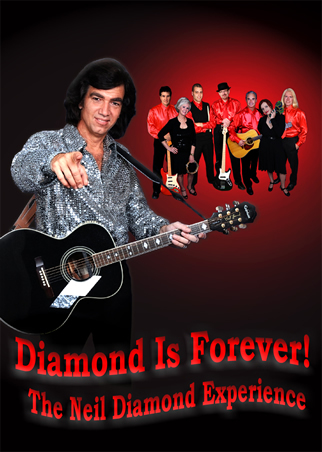 David Sherry is best known for his impression of the pop icon, Neil Diamond, with his inspired tribute show, DIAMOND IS FOREVER! David began his professional entertainment career at the age of 16 playing in a folk group and performing in musical theater while studying and living on the Mediterranean Island of Malta where he appeared at the Dragonara Palace Casino and other entertainment venues. There he appeared in numerous productions in both musical and dramatic roles. At age 17 he appeared in a European production of the rock opera “Jesus Christ Superstar,” in the supporting lead role of Judas Iscariot. David’s voice and talent did not go unnoticed by the local press and his time in Europe brought many firsts ranging from appearing on both television and radio to singing and performing on the stage of the oldest standing operational theater in Europe, The Manoel Theatre in Valletta, Malta. Here David performed his first Diamond song “Sweet Caroline,” live along with the Elvis classic, “Blue Suede Shoes.” David toured and performed in Europe for over 7 years, visiting and residing in such exotic locations as Malta, Italy, Sicily, Portugal, England and Tunisia in Northern Africa before returning to the United States.Click picture to ZOOMBack in the United States David’s professional experience included many years as a renowned professional MC, disc jockey, vocalist, entertainer and show producer and, in more recent years, he made his mark on the West Coast as manager and promoter of the 12-piece B!G DADDY ORCHESTRA, nominated “Best Big Band” at the “San Diego Music Awards” for two consecutive years. Notable also was the success of his musical production, A TRIBUTE TO THE STARS!, staged at numerous venues including The California Center for the Arts, Escondido, The La Costa Resort, Hotel Del Coronado and with much acclaim at Lawrence Welk Resort Theater. This lead to David performing Diamond songs live on a TV morning show in San Diego. Seeing Diamond in concert inspired David to follow his dreams of working in entertainment. “I knew a lot of guys in the 50′s who dreamed of bein’ the King–being Elvis–but I was a 60′s kid and I wanted to be like Neil Diamond! He was the cool guy to me–to my era. Click picture to ZOOMI still have an old black and white photo of myself singing at a theater in Europe in 1973. I was 16 and I’m surprised now to see that I looked so much like Diamond did at that time! My hair is the same. So are my clothes: a shirt with a big collar and puffy sleeves, a fringed vest, bell-bottomed pants and boots! Seems I was one of the original Neil Diamond look-alikes before they ever existed. But I was really just being me, young and alive in the 70′s.